Understanding the local and regional patterns of species distributions has been a major goal of ecological and evolutionary research. 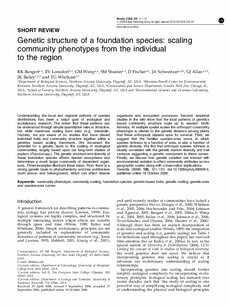 The notion that these patterns can be understood through simple quantitative rules is attractive, but while numerous scaling laws exist (e.g., metabolic, fractals), we are aware of no studies that have placed individual traits and community structure together within a genetics based scaling framework. We document the potential for a genetic basis to the scaling of ecological communities, largely based upon our long-term studies of poplars (Populus spp.). The genetic structure and diversity of these foundation species affects riparian ecosystems and determines a much larger community of dependent organisms. Three examples illustrate these ideas. First, there is a strong genetic basis to phytochemistry and tree architecture (both above- and belowground), which can affect diverse organisms and ecosystem processes. Second, empirical studies in the wild show that the local patterns of genetics based community structure scale up to western North America. At multiple spatial scales the arthropod community phenotype is related to the genetic distance among plants that these arthropods depend upon for survival. Third, we suggest that the familiar species-area curve, in which species richness is a function of area, is also a function of genetic diversity. We find that arthropod species richness is closely correlated with the genetic marker diversity and trait variance suggesting a genetic component to these curves. Finally, we discuss how genetic variation can interact with environmental variation to affect community attributes across geographic scales along with conservation implications. © 2008 Nature Publishing Group All rights reserved.